Archeologists work at a site where an ancient stone calendar was found. Archaeologists have found a stone tool assumed to be an early calendar dating back 4,000 years in a cave in the northern province of Tuyen Quang. 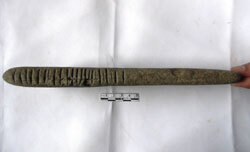 A similar tool was found in Na Cooc Cave in the northern province of Thai Nguyen's Phu Luong District in 1985, Chung said. Similar items have been found in various areas in the world, including China, Israel and the UK, suggesting that people 5,000 years ago knew how to calculate the lunar calendar by carving on stones. A number of other stone tools were buried with the corpse, he added. 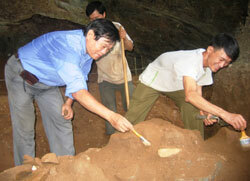 The excavation was conducted on a total area of 20sq.m inside Nguom Hau Cave in Na Hang District, unearthing about 400 objects to a depth of 1.2m belonging to two cultural layers of the Late Neolithic period (4,000-4,200 years ago) and the Metal Age (around 3,000-3,500 years ago). The deeper layer (of Late Neolithic), about 1m thick, consisted of well-polished axes and other stone tools, while the later cultural layer measured only 20cm contains fewer tools with axes and ceramic pieces. There was also a large amount of animal teeth and shells found at the site, thought to be the remnants of food left by the ancient dwellers. Scientists also found traces of burned coal and fire in both layers. The cave was discovered in May of last year, while the excavation was conducted within a 20-day period earlier this month. Earlier excavations in the same province have found traces of human populations dating back to 7,000-8,000 years ago.